Editor’s note: Lluiya v. RWE, now pending in the courts of Germany, is a noteworthy litigation concerning the potential liability of greenhouse gas emitters for the damages caused by climate change. The blog below presents an analysis of the case from the point of view of a lawyer who is working with the plaintiff. We also invited defendant’s counsel to submit an analysis from their point of view. Can big emitters of GHGs possibly be held liable for nuisance caused by climate change to private property? In an oral hearing on 13th November, the Oberlandesgericht (Civil Court of Appeals) of Hamm (Germany) answered the question of possible legal responsibility of a big GHG-emitter for climate damage/nuisance in the affirmative. Saul Luciano Lluiya, the plaintiff, is a Peruvian citizen. His house is located in the town of Huaraz in a valley underneath Lake Palcacocha, a glacial lagoon. He asserts that CO2 emissions of power plants operated by the defendant have contributed to climate warming and thereby to accelerated glacial melting and the rising water level of the glacial lagoon, by which the safety of his house is endangered. He claims that at any time big chunks of ice from the Palcaraju Glacier above the lagoon may break off and trigger a huge Glacial Outburst Flood that may destroy his house. RWE, the defendant, is a German electric power company, the biggest in Europe. Based on the so-called Carbon Major´s Report (http://carbonmajors.org/), RWE is responsible for 0.47 % of global CO2 emissions. Because of defendant‘s contribution to global warming and it effects, the plaintiff asks the defendant to make an equivalent contribution to the costs for security measures to protect his house against the flooding risk. The court of first instance, the Landgericht Essen (Regional Civil Court), denied this claim in 2016. Although acknowledging, that “in all likelihood, in the case of a flood wave, the house of the plaintiff would be flooded” and that “scientifically” climate change might be responsible, it rejected the claim on legal grounds notably with respect to legal causality. In essence the lower court argued that because of the complexity of climate change, specific impacts of climate change could not be attributed to individual emitters, and since everyone emits greenhouse gases, no single emitter could be held liable. Accordingly the court dismissed the claim without taking evidence about partial causality of the GHG emissions from the defendant´s power plants for the danger of being flooded to which the plaintiff´s property is exposed. (1) Because of the significant increase of the expansion and the volume of the Palcacocha Lagoon there is a serious imminent interference of the plaintiff´s property underneath the lagoon being flooded or exposed to a mudslide. (2) a) CO2-emissions release by poswer plants of the defendant rise into the atmosphere causing as to law of physics a higher atmospheric concentrations of GHGs. b) The higher concentration of GHG molecules causes a decrease in the escape of heat from the earth, which in turn causes a rise of global temperature. c) Because of the consequential rise of mean temperatures also locally, there is accelerated melting of the Palcaraju Glacier, the size of the retreating glacier diminishes, and the volume of the water increases so much that it cannot be held back by the natural moraine. d) The proportion of the partial causation with respect to the causal link as to a) to d) is measurable and calculable. It adds up to 0.47 % today. A different proportion of partial causality, if observed, shall be determined and stated by the expert. Can courts decide such a case at all, or should it be left as a political question to government and parliament to regulate climate liability, because of the far reaching political and economic implications of the attribution of loss and damage caused by climate change to particular GHG emitters? The Court of Appeals of Hamm accepted justiciability following the line of reasoning by courts in other countries in climate law cases. It found there was no violation of the principle of separation of powers as laid down in Art. 20 Sec. 2 GG (German Basic Law), concluding that the case can be decided on the basis of existing laws, namely § 1004 BGB (German Civil Code). The court deemed that this consideration applies also to GHG-emissions and their effects. The courts of which country have competence to decide a climate litigation case, which has relations to different countries? The courts of the country of origin of the damage (Germany as the place where the GHGs are or were emitted) or of the country where damages due to climate change materialize (in this case Peru)? According to § 32 a ZPO (German Procedure Code), local jurisdiction in environmental cases lies with the courts at the place of origin of damage (not the place where the damage accrues). This rule applies analogically to international jurisdiction when a case has a connection to different States (Peru and Germany). Hence German courts have jurisdiction in the Huaraz Case according to German procedural law. The law of which country (Germany or Peru) governs the case with respect to substantive law questions? A question to be distinguished from the preceding one concerning jurisdiction. It refers to the problem of the applicable law under the rules of Private International Law or in Anglo-American terminology Conflict of Laws. According to Art 7 Rom II, the European Regulation concerning the applicable law with respect to non-contractual obligations, in principle the substantive law of the place where a damage accrues applies. Rom II is a so-called “loi uniforme” which governs also cases with non-European relations. This would mean that Peruvian Law should be applied to decide the Huaraz Case. However Art 7 Rom II allows the plaintiff to base his claim alternatively on the law of the origin of the damage/nuisance (Germany), which the plaintiff in the Huaraz Case has done. What then are the concrete legal provisions and rules of substantive German law a German court has to apply in the Huaraz Case? (1) If property is interfered with by means other than removal or retention of possession, the owner may require the disturber toremove the interference. If further interferences are to be feared, the owner may seek a prohibitory injunction. (2) The claim is excluded if the owner is obliged to tolerate the interference. § 18 Umwelthaftungsgesetz (German Environmental Liability Act) explicitly provides that liability under the provisions of this special law does not exclude liability as to other laws. This is different as regards the US Clean Air Act, which according to its interpretation by US Federal Courts displaces Federal Common Law concerning nuisance. § 14 Bundesimmissionsschutzgesetz (Federal Law Concerning Protection against Emissions) applies only with respect to negative effects of emissions within Germany because operating licenses are not effective extraterritorially under International Public Law. In addition the plaintiff bases his claims with respect to a compensation of costs incurred to enhance the safety of his house on the principles of agency of necessity (§§ 683, 670 BGB) and unjust enrichment (812 BGB). The causality question lies at the heart of the case. Is it possible to establish legally relevant causality in climate litigation cases? The Court of Appeals of Hamm takes this position. Because the climate is of a highly complex nature it seems to be difficult to trace causality from a specific source (or country) where GHGs are emitted, to a specific event at a place often far away from the source of the emissions. In view of the innumerable small and big contributors to GHG emissions all over the world it seems to be likewise difficult to trace a legally relevant causal link to a single emitter of GHGs. If such a link can be shown, how is it possible to determine the scope of liability of single emitters taking into account that the effects (nuisance/damage) are of a cumulative nature? Does partial or joint and several liability apply? Furthermore considering the multiple factors coming from the “outside” and having influence somehow on the causal chain, how can one be sure that a company’s GHG emissions do have an impact at all and if so to what extent a relevant causal influence with respect to specific consequences? These are certainly difficult questions but they do not preclude legal causality per se – at least as to the criteria of German Law as shall be shown. The first condition is the “conditio sine qua non” rule which in Common Law terminology is known as the “but for rule”. As to this rule causality exists only if a certain event or consequence would not have happened without the condition in question. This condition applies also for partial causation. 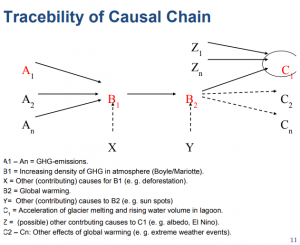 The second condition for legally relevant causality is “adequacy” of the causal chain. This is a value judgement by which extremely unusual consequences of a certain activity are excluded from attribution. In Common Law systems this is the “proximate cause” condition in the sense of reasonable foreseeability. The Essen Court (court of first instance) wrongly held that neither the “but for” nor the “adequacy” condition for legal causality could possibly be satisfied in the Huaraz Case because of the complexity of climate change and the fact that nearly everybody contributes to GHG-emissions and thus to climate change. Of course climate change is of a highly complex nature. But this does not hold indistinctively to the same degree for every phenomenon connected with climate change. When dealing with climate change and its effects one has to distinguish between extreme weather events like hurricanes or droughts on one side and slow onset events like sea level rise or the accelerated melting of glaciers on the other side. A single extreme weather event may be still difficult to link with climate change – at least up to now. But this does not hold likewise for slow onset events such sea level rise or the accelerated melting of glaciers due to climate warming. With respect to slow onset events of this kind, a causal link to GHG emissions that meets the requirements of the “but for rule” can undoubtedly more easily be satisfied, taking into account the findings of modern climate science as stated in the reports of the Intergovernmental Panel on Climate Change (IPCC). (1) Every single CO2-emitter contributes by his emissions to a rising concentration of GHGs in the atmosphere all over the world. This corresponds to laws of physics regarding the expansion of gas molecules. (2) Higher concentration of GHG in the atmosphere entails global warming all over the planet, not excluding the Palcacocha area. (3) Rising temperatures lead to an accelerated melting of glaciers, including the Palcaraju glacier. (4) This causes a rising water level of the glacier lagoon with a growing risk to plaintiff´s property of being flooded. The graph below illustrates this causal link between the CO2 emissions of single emitters like the defendant and the rising water level of the Palcacocha Lake. The graph likewise illustrates that partial causality of the CO2 emissions for the accelerated melting of the glacier and the rising water level of the lagoon is not precluded by other factors “coming from the outside”(like sun spots, albedo changes, El Niño, climate variability). These factors may have an additive or modifying effect on the causal chain but do not “interrupt” it in a legally relevant manner. What about the Essen court’s argument that an “adequate” causal chain between CO2 emissions by a single emitter and a certain event caused by climate change cannot exist because the defendant is only one of innumerable emitters? This however is not an argument as to adequacy (which refers to reasonable foreseeability) but a consideration that relates to the strength and magnitude of the causal impact of GHG emissions of single emitters (“drop in the ocean” problem). Taking into account that GHG emissions of the defendant amount to about 0.5 % of global emissions – equal to the total GHG-emissions of the Netherlands – they rightly cannot be regarded as irrelevant for climate warming and its consequences. With respect to the cumulative character of the causation – the defendant only being one of many contributors to climate change – the Court of Appeals in its oral hearing took the position that with reference to proportional causation, only partial and not joint and several liability can be justified. 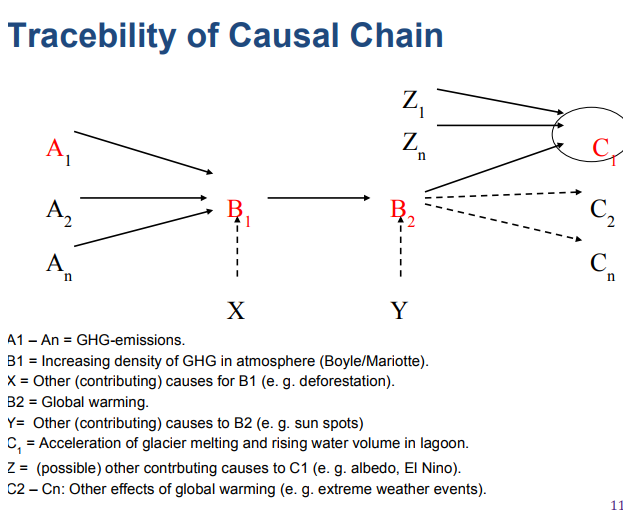 There remains the question of how to determine the scope of defendant´s liability taking into account all the different factors (albedo, El Nino, sun spots, natural climate variability) that possibly may have had influence on the causal chain (without interrupting it). This problem was not expressly addressed by the Court of Appeals of Hamm up to now. In cases where a damage is caused by multiple factors, according to German Civil Procedure Law the causal contributions by a certain defendant can be estimated by the court ( § 287 Sec. 1 S. 1 ZPO analogous). If a causal link can be proven between GHG emissions and loss and damage caused by climate change – which seems very probable as to slow onset events and may in the future also be possible for extreme weather events – big emitters can be held liable in the ratio of their contribution to climate change. Law can thus contribute to a fair attribution of external costs caused by the use of fossil energy and thus ultimately promote a faster conversion to alternative energies with lower costs. But the attribution of climate liability to those who cause climate change and its adverse effects is not only a question of economic rationality but also serves climate justice according to general principles of tort law and the no harm principle as recognized in international public law. Of course, the Huaraz Case refers to German Law and the legal details concerning climate liability will not be everywhere the same. The Huaraz Case can however serve as a model to be tested also in other jurisdictions taking into account the legal characteristics and features of the different law systems. Roda Verheyen represents the plaintiff in court. The author of this article was engaged in developing the legal arguments on which this law suit is based (Frank, “Climate Change Litigation”, NJW 2010, 3691 f (NJOZ 2010, 2296 ff)); Frank, “Klimahaftung und Kausalität”, ZUR 2013, 28 ff. ; Frank, “Störerhaftung für Klimaschäden?”, NVwZ 2017, 664 ff. Court at business seat of the defendant. E. g.: Massachusetts v. EPA, US Supreme Court. 549 US 497 (2007); “Urgenda Case”, Rechtsbank Den Haag, ECLI:NL:RBDHA: 2015:7196; Ashgar Leghari v. Federation of Pakistan, Lahore High Court Case No: W.P.25501/2015. See below section 2.4 of this article. Mugdan, Materialien zum BGB, Sachenrecht (1899), 146. Translation by author. European Law does not apply because the relevant Regulation (No 1215/2012) governs only civil procedure cases beween parties of different European States. Jurisdiction according to § 32 a ZPO in environmental nuisance cases at the place of origine is exclusive. A Peruvian judgement in the Huaraz Case therefore would not be recognized and enforced by German courts (§ 328 ZPO). Which is different from the Regulation concerning International Procedural Law (see Sec. 2.3). Official translation in www.gesetze-im -internet.de/englisch_bgb/. E. g. Kivalina v. ExxonMobil Corp., 696 F.3d 849 (9th Cir. 2012), cert. denied, 133 S.Ct. 2390 (2013). In the Kivalina case (see footnote 11) the plaintiff (Kivalina) sued a limited group of energy companies for joint and several liability with respect to their responsibility for the whole nuisance. Joint and several liability would have been also denied under German Law.